Commas can be life changing. I mean, for the thief next to Jesus, it was the difference between paradise today or paradise thousands of years in the future. Before we talk about the comma, though, think about what comes after it. Jws believe Jesus will reign over paradise earth from heaven. But he told the thief he would be “with him” in paradise. How do Jws make that work? Jesus would need to be on the earth in Paradise in order to be with him there. Did you know the NWT is the only translation that says “Truly I tell you today, you will be with me in Paradise”? Did you also know that the term “paradise earth” is not in scripture? The only use of the word paradise seems to be another term for heaven…or a specific place in heaven. Seems like Jesus said “truly I say to you” some other times in the Bible. Big thing I noticed: Jesus never included “today” as part of the phrase. Instead, he would say “truly I say to you” and then he would say the thing that was true. So, adding “Today” into the first part of the sentence does not fit with the way Jesus always used it. Another thing I noticed: NWT uses the word “tell” instead of “say” in this one instance. Could this word be translated “tell” instead of “say?” Of course. It’s translated “tell” in many translations. They mean the same. Whats suspicious is the same word translated “say” in 44 other places, is rendered “tell” for this special occasion in the NWT. What benefit would this have for the NWT? Well…for one thing, in a search it doesn’t come up exactly the same as the rest. It separates this particular occurrence of the phrase from the others. It makes us think…oh, there must be something different about the way Jesus says it this time so we can’t compare it to the other times. But no. It’s not different. 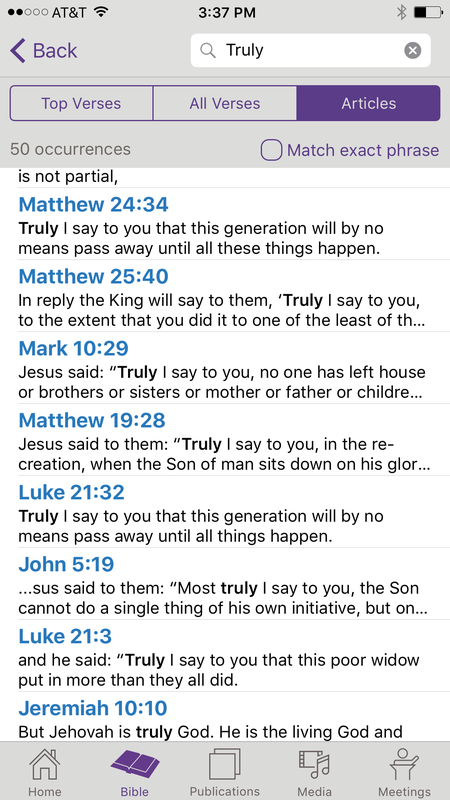 In fact the only difference (highlighted in yellow below) is the fact that the “you” that Jesus is telling the truth to is a single person instead of plural. Usually he is speaking to a crowd or to a few people. This is the reason there’s a small word difference in the Greek. (See the photo below for some comparisons). The word for “say,” however, is the same. They changed it to “tell” because they want this verse to be perceived as different so the connection might (hopefully) be missed. Also just to drive the point home a little more, the new world translation translates another verse directed at a singular person (nicodemus) as “say” and not “tell”. So that must not be the reason they changed it either. But as you can see the Greek words are the same as they were when Jesus was speaking to the singular thief. So my conclusion is the NWT bent over backwards To use a loophole (that punctuation is not present in the Greek and has to be used at the translator’s discretion when translating to English) in order to support a doctrine that is unique to them even when NOBODY who translated an English translation agreed with them. How can the thief be with Jesus in paradise since he is presumably not one of the annointed and they don’t believe He is omnipresent? Next Post Knowledge or Glory? “Oh,” says the former thief, “then when is he going to visit us? That’s what he must have meant, right?” They answer, “Well, no. Jesus and the other heavenly beings will never come here.” Then the thief says . . . Well, I don’t know what he would think, feel, or say. Jesus didn’t speak clearly? Jesus promised something he couldn’t deliver on? Jesus told him a comforting thought to make him feel better during his agony on the torture stake? Here’s what I really imagine: The former thief wakes up, sees Jesus, and says, “I don’t care whether I’m in heaven or on earth. You’re here with me, and that makes any place paradise!” Because whatever Jesus promises, that’s what will happen! That’s exactly how I feel about eternity. As long as it’s with Jesus I don’t care about the details of heaven or earth (even tho there are details to be known)…wherever Jesus is. That’s where home is. So many Jws have asked me “and just what do you think you will be doing in heaven?” as if they think it would be boring! I can’t even fathom how they think riding elephants (which they can do this weekend at the zoo if they so choose) and farming big fruit in tropical weather with kids that don’t fight next to lions that don’t bite…could be comparable to being in the presence of the creator of the universe. Melting into a puddle of worship at the nail scarred feet of Jesus. Singing with angels…joining with the living creatures saying “Holy Holy Holy”…seeing his robe fill the temple…learning the deep mysteries of God and his word…living in the “place” that Jesus went to prepare…being the bride of the heavenly groom. I can’t imagine how incredible every moment of eternity would be in his glorious midst. But I would not trade it for tame panda bears. Let me see him face to face. Let me dwell in the house of the Lord forever. Amen.